I've often appreciated Albert Brooks and his unique social commentaries, as an actor (an all-time performance in Broadcast News), as well as an actor/writer/director (Defending Your Life, Lost In America). So I wonder if his vision of the not-too-distant future was originally intended for the big screen, instead of as a mere novel. But the book is not only funny and cynical, but very imaginative and thought-provoking. Welcome to 2030: The Real Story of what Happens to America. In an era of watch-phones, self-driving cars, and fat-killing pills, cancer has been cured and the average life expectancy is well over 100 years old. Seniors are living so much longer that Social Security is draining the American economy, and "the olds" have become targets for hate crimes. The disenfranchised American youth knows that in deficit-ridden America they will never see their slice of the pie, and have resorted to terroristic acts like suicide bombing casino buses and hijacking cruise ships. It's like The Jetsons meets The Hunger Games. And with no escape in sight to the country's deficit, the big one hits LA. With one million dead and over 90% of the city destroyed, President Matthew Bernstein (the first you-guessed-it president) enters into a desperate partnership with China to rebuild Los Angeles. Meanwhile a Chinese visionary completely revamps the US health care system, marries into a formidable political family, and eventually runs for President. 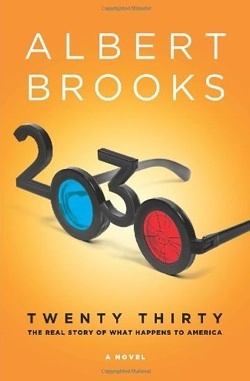 Yes 2030 comes off the rails, but it's a pretty good ride most of the way while the future flashes before our eyes.